“The Old Highlife” is a time machine set to the golden days of West African pop. Guitarist Agyemang and lead singer Roadmaster, along with producer Beston Barnett, mine into the veins of the Gold Coast’s first electrified music, returning with nuggets of the richest hue: the sparkling guitar of a first love, the funky bassline booming out the glory of God, even to the shout of joy at a funeral block-party. Absolutely all profit goes directly to the musicians, who could use it given that salaries in Ghana come to a little less than 3 CDs a month (for a good job). I first came to Kumasi with only a vague idea of finding a guitar teacher. In Accra, the capital, live music seemed to be on the decline. The few bands playing at tourist hotels favored American standards and South African reggae over the old highlife that had attracted me to Ghana in the first place. My wife and I were hardened travelers at this point, so a few old tapes of compelling harmonies and sparkling, almost Caribbean guitar were enough to draw us across the Atlantic with malaria pills and Twi/English dictionaries stowed in our backpacks. After a few days asking around, I was led one afternoon to Shekinah Recording Studios and my first meeting with Nana Opoku Agyemang. The apprenticeship started immediately. In the first week he taught me most of the songs on this recording, and in the second week we began tinkering with them, changing bass lines and inventing interlocking guitar parts. Agyemang was more than enthusiastic. At his music studio, everything is done on the synthesizer, so despite the fact that he had spent the better part of his life touring with various highlife bands across Africa, he hadn’t played the guitar seriously in a decade. The lessons became social events, a parade of family and friends singing harmony, tapping sticks against coke bottles, and cooking fufu. But when Agyemang’s old friend Roadmaster came onto the scene, with his soft, lilting voice and his sense of sweet harmony, everything seemed to fall into place. In the third week we made this record. “The Old Highlife” casts a wide net. There are songs here which were old when Roadmaster was a choir-boy forty years ago, and songs which Agyemang wrote as we sat down to record. There are tracks with nothing but acoustic guitar, and others bursting with the electric bubbling two-guitar style and tight vocal harmonies that characterize West African pop and dance music. There is happiness in the midst of great loss, love in poverty, reason in confusion, and gospel light shining through despair. And in the midst of the “old” highlife, there is always something to be found that’s alive, vibrant, funky, and new. 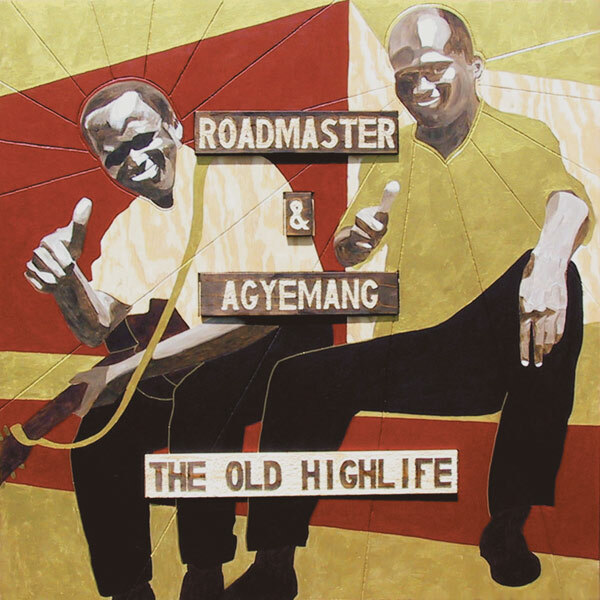 …Deserving of attention on somewhat of a different level is Roadmaster and Agyemang’s THE OLD HIGHLIFE. An American musician named Beston Barnett traveled to Ghana to absorb some of that country’s musical roots, eventually hooking up with guitarist Nana Opoku Agyemang and vocalist Roadmaster, highlife veterans both. Through some thankfully serendipitous circumstances this album was made, and the core essence of highlife it captures is a testament to the commitment of those who made it. It is unadorned highlife- just guitars, bass, drums and voices, but the prominent guitar interplay is expertly tight, the vocals dryly soulful and the songs (some old, some new) are refreshingly snappy. Also refreshing is how unpretentious this music sounds. What you hear is what it is: some guys who got together to record roots highlife because they love it. I’m glad they did, for there is much to love in the results. My spirits have been lifted frequently by obscure little record companies that release unpretentious, essential music. Art Hurts Records, AKA Beston Barnett, sent me a gem of a recording made during a week in Ghana last year, The Old Highlife. Centered on the singing of Roadmaster and the highlife guitar of Agyemang, The Old Highlife is a time machine that takes one back to the golden age of music on the Gold Coast. The veterans play their hearts out, aided by Barnett on bass, and the result is fine, tight music as pure and simple as sunlight. I love this record and have listened to it more frequently than any other recording this year. Since all profits go to the musicians, by all means buy this recording and smile. Been doing a lot of home living and home cooking lately. Today’s track is especially great for when you’re chopping onions.. knife in my left, glass of red in my right, highlife-ing around the kitchen. You can hear this tune on the Art Hurts release, The Old Highlife. It’s the baby of Art Hurts Records’ Nashville native, Beston Barnett. He went to Ghana on his Honeymoon and ended up studying guitar with Nana Opoku Agyemang. Three weeks into the lessons he managed to convince his new teacher to record an album with long-time friend, Amankwah “Roadmaster” Ntori. You might recognize Agyemang’s guitar from, among others, F Kenya’s Band that we heard here before on one of Ulubujaja’s guest posts. And in case you’re wondering, Roadmaster gets his name from his mom since he used to walk for miles on foot. Categories: album, The Old Highlife (2001) | Permalink.